Did you ever wonder how a crappy action figure creates so much demand? Hasbro just has to put the word "limited to...." on it. Check out the Darth Vader (Exclusive Collectors Edition) TARGET exclusive action figure, a figure that should have never sold out on day one but did. It's all in our Research Droids Reviews database right now! Feel free to leave your own thoughts in our comments section, vote in the poll or even leave comments about it on our Facebook page. Click the banner below for the direct link to the review! As always, you can also send your own personal review requests via email if you'd like to see something that we didn't cover yet. Knights of the Old Republic received a nod from Hasbro with the final Build A Droid figure from The Legacy Collection. HK-47 is a fantastic addition to the line! Click below for our detailed Visual Guide, including our unique parts catalog to help you on your way to building this droid! You can also visit our Research Droids Review, where we gave this figure top marks! JTA reader Danny O. eagerly writes into us that he found Gamorrean Guards at his local Five Below! If you're lucky enough to have a store near you, get there stat! Click through for his report! G.I. Joe: Retaliation pre-orders have returned! Place your pre-orders now for the upcoming Wave 2 action figures and vehicles. GI Joe Wave 1 is still available now at Brian's Toys. Also, the next Marvel Universe and Legends waves are now available for pre-orders. Brian's Toys has also found a few more eFX Darth Vader Helmet replicas available for $799.99. Several Vintage AFA Graded Vehicles have also been added to the site. Swing on over to Brian's Toys to complete your collection today! For this week's newsletter visit Brian's Toys! JTA Announces Facebook Contest Prize Pack! It All Begins December 8th! It's time to announce the prizes we're giving away for our Facebook contest! Click through if you're interested! The 2007 TAC Saga Legends line had some amazing army builders in it. But it also brought rare figures to the marketplace including Pit Droids [Orange - Version 2]. Check them out in our Research Droids Reviews database right now! Feel free to leave your own thoughts in our comments section, vote in the poll or even leave comments about it on our Facebook page. Click the banner below for the direct link to the review! As always, you can also send your own personal review requests via email if you'd like to see something that we didn't cover yet. The elite Advanced Recon Commandos have received special programming that allows for independent thought. ARC troopers are used for exceptionally dangerous missions that require flexible, self-sufficient thinking. 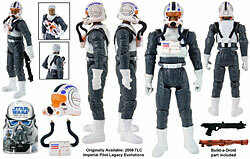 Check out this repainted repack from The Legacy Collection in today's Visual Guide Update! You can also enjoy all-new and updated galleries in our Research Droids Review! French Version Of The Ultimate Action Figure Collection Arrives! JTA French affiliate ToyzMag.com have reported in that the French translation of The Ultimate Action Figure Collection has arrived! Click through to read their thoughts an be sure to use Google Translate if you need it in English! Special advance thanks to Julien for his time reviewing this version of the book. We will be linking to it once completed!! BREAKING NEWS: Huge Action Figure Auction To Benefit Rancho Obi-Wan! An auction of one of the most complete collections of loose Star Wars action figures has just been launched today on eBay for the benefit of the nonprofit Rancho Obi-Wan, which houses the world’s largest private collection of Star Wars memorabilia: http://eBayActionFigureAuction. The auction is in conjunction with the anniversary of the northern California museum and the release of the new book, Star Wars: The Ultimate Action Figure Collection (Chronicle Books, $40) Click through for all the details and the press release! The 2007 TAC Saga Legends line had some amazing army builders in it, like the Biker Scout. Check him out in our Research Droids Reviews database right now! Feel free to leave your own thoughts in our comments section, vote in the poll or even leave comments about it on our Facebook page. Click the banner below for the direct link to the review! As always, you can also send your own personal review requests via email if you'd like to see something that we didn't cover yet. We have always felt that the 30 (77-07) is one of the greatest collections of figures Hasbro has done to date. While not all of them were made in the expected super-articulated fashion that’s become standard today, many of the figures brought into the line are nonetheless done so well from the start that they will likely never see an update again. We will be releasing updates to this very cherished line wave by wave. We have updated our Visual Guides and we’ve processed all-new expanded galleries and a new “stats box” that mimics the card backs of the figures in the line in our Research Droids Reviews. Click through for all the details of wave 1! Clone troopers receive specialized training for the particular skills needed to be fighter pilots. They enter their first combat at the Battle of Geonosis and go on to fight throughout the galaxy in their ARC-170 and V-wing fighters. The Legacy Collection finished up its run with a series of repacked figures. Clone Pilot originally came to us from the highly popular Evolutions line, and these well-done figures are always welcome to the basic figure treatment! Click below to check out this figure's Visual Guide, and read about him in our popular Research Droids Review! Ten Dollars Off of $30 at Amazon For A Limited Time! Amazon.com currently has a $10 off $30 Star Wars Sale! Not a huge selection, but perhaps there's something to be found, and with $10 off that would bring the price down on some of those The Vintage Collection figures. Worth taking a peek! A big thanks to JTA reader Brandon for bringing this to our attention! The Ultimate Action Figure Collection Video Review! The Ultimate Action Figure Collection is already being reviewed on YouTube.com and I STILL don't have my own copy yet! Click through to check out this thorough (and very accurate if I may add) video review! Make sure you stop by Amazon.com to order yours! TVC TRU Exclusive Millennium Falcon To Hit Seasonal Low December 2nd! Great news folks! According to TRU's latest ad, The Vintage Collection Millennium Falcon will go on sale for $179.99 beginning December 2nd! Special thanks to JTA reader Eric G. for the head's up!! A good old plain white phase I Clone Trooper is always a welcomed release, no? See one of the best released by Hasbro, the 2007 TAC Clone Trooper (Attack Of The Clones) Saga Legends figure, as he's available to ogle in our Research Droids Reviews database right now! Feel free to leave your own thoughts in our comments section, vote in the poll or even leave comments about it on our Facebook page. Click the banner below for the direct link to the review! As always, you can also send your own personal review requests via email if you'd like to see something that we didn't cover yet. Anakin is a Jedi Commander when the Clone Wars begin, though he frequently displays reckless heroism in battle and daring maneuvers in starfighter combat. Battling secret fears, he chafes under the restrictions of the Jedi Order. This version of Anakin comes to us directly from the Revenge of the Sith Evolutions set, packaged on a basic card for the first time in The Legacy Collection. Click below to check out this very well done figure, deserving of the basic figure treatment! You can also read our full report, complete with updated galleries, in our Research Droids Review! Five Below Gets The Most Desired Figure In Store For $5 Each! JTA close friend Dan Curto writes in with an UNBELIEVABLE find! Look what he found at Five Below!! HURRY! All Of The Hot TVC Figures In Stock At HasbroToyShop.com!!! HURRY!!!! Malgus, Starkiller, Vizla, Tarkin, Gamorrean Guard, 501st Legion Clone Trooper, and Imperial Navy Commander ARE ALL IN STOCK as of this posting at HasbroToyShop.com! Use PROMO code CHURCH10 for an additional 10% off and orders over $25 ship FREE! Receive a $10 coupon (Coupon expires March 31, 2013), good on a future purchase of $10 or more at HasbroToyShop.com too! Special thanks to JTA reader Brandon Y. for the head's up!!! 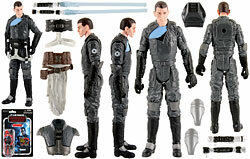 UPDATE: 501st Legion Clone Trooper, Starkiller, INC and Vizla are already out of stock. These will disappear fast so don't delay! Does anyone else find it odd that Hasbro bothered to give us another Sandtrooper [Squad Leader] in the Saga Legends line when they already had the Evolutions version? We ponder this and more in the Research Droids Reviews database today! Feel free to leave your own thoughts in our comments section, vote in the poll or even leave comments about it on our Facebook page. Click the banner below for the direct link to the review! As always, you can also send your own personal review requests via email if you'd like to see something that we didn't cover yet. Sponsor News: DASH Your Collection & Win a Hot Toys Luke! We think Collector-ActionFigures.com is the absolute best way to manage your action figure collection, and that’s why we’re willing to give away an unbelievable figure like the Hot Toys Luke Skywalker to make sure you notice. Just complete a free membership registration with Collector-ActionFigures and you could be the lucky winner of this $300 prize. Click through for more! Tarados is one of the two hundred Jedi who arrive on Geonosis to stop the execution of Obi-Wan, Anakin, and Padmé. The Klatooinian Jedi storms into the arena with his lightsaber ablaze to fight the Geonosian warriors and battle droid army. Now you can check him out in our The Legacy Collection Visual Guide, as well as read our full report in our Research Droids Review! 20% OFF ALL POSTERS AND POSTER SETS NOW THROUGH CHRISTMAS! Our newly released Star Wars Poster Collection is similar to the work of Olly Moss and is created by Lynx Collection, a division of Fiore Collection. All posters are limited to only 750 prints and are printed on satin photo paper with a luster finish; 100 year archival. Click here to check them out! Entertainment Earth is having their Cyber Monday sale through the end of Tuesday night. Make sure to stop by to see if you can find some great online deals! 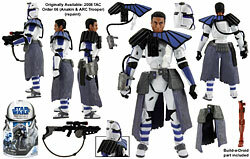 Another great choice for the Saga Legends line in 2007 was the Clone Commander. Essentially a Hasbro concept, he can be converted into a 41st Elite Corps Clone Trooper which made him the perfect army builder. See why you need lots of him in our Research Droids Reviews today! Feel free to leave your own thoughts in our comments section, vote in the poll or even leave comments about it on our Facebook page. Click the banner below for the direct link to the review! As always, you can also send your own personal review requests via email if you'd like to see something that we didn't cover yet. Wave 16 Found At Comics Shops In USA! JTA reader Danny O. has found wave 16 at his local Comics shop. We suppose this is a no brainer, but we didn't think about checking oout those shops until now. If you're looking to plug in some holes in your collection, this may be another great option for you! Black Sunday? Stuff Still Continues To Trickle Out! In this concept art by Sang Jun Lee, Anakin wears the "dark Jedi" apparel that outwardly reflects his inner conversion to the dark side of the Force. The outfit was designed to echo the clothing worn by his son Luke during the climactic battle with Emperor Palpatine. Concept art figures became hugely popular with the 30 (77-07) line, and we get a little taste of it in The Legacy Collection with Episode III Concept Art Anakin Skywalker. Click below for our detailed Visual Guide, and, as usual, this figure can be found in our Research Droids Reviews database! It’s a huge show that’s been a long time in the making but some things are worth waiting for as we bring you the latest Curto Burns Collectors Cast. This Special Edition show brings together all members of The Force United to discuss the announcement of the acquisition of Lucasfilm by Disney and the news that we’ll finally be seeing the sequel trilogy of Episodes 7, 8 and 9 starting in 2015. Join Dan and James as they ask their friends from Jedi News, Jedi Temple Archives, Mint In Box, Sandtroopers, Star Wars Action News, Yakface, YodasNews and newest member Sarlacc Pit Podcast (Galactic Binder) what they think of the news. If that wasn’t enough, we check in with the almighty Kyle Newman and since no Curto Burns Collectors Cast would be complete without a visit to Rancho Obi-Wan, we hear from the master himself Steve Sansweet too. Subscribe for free through iTunes or download at CurtoBurns.com. Sponsor News: K&C Collectibles - Special Cyber Monday Announcement! K & C Collectibles is offering all customers 15% discount on in-stock merchandise. The discount code is "Cyber2012". This offer starts today November 25th at 8:00am EST through midnight Tuesday November 27th, 2012. Offer not valid on pre-order items. All merchandise will earn 2x - double reward points. We have added a variety of new items to our inventory. Click through for more! Is the purpose of releasing the super clean Sandtrooper [Sergeant - Version 2] to give really collectors another Stormtrooper with extra gear? We're not sure, but we certainly don't fully understand it. It's all discussed in our Research Droids Reviews today! Feel free to leave your own thoughts in our comments section, vote in the poll or even leave comments about it on our Facebook page. Click the banner below for the direct link to the review! As always, you can also send your own personal review requests via email if you'd like to see something that we didn't cover yet. Gregar Typho is Senator Padmé Amidala's head of security and an able starfighter pilot. He is diligent and capable in the performance of his duties, yet he is up against devious enemies who will stop at nothing to eliminate Padmé. You can check out The Legacy Collection's BD 47 in our detailed Visual Guide below, and don't forget to read about him in our Research Droids Review! Red Bandana Kithaba (Skiff Guard) Hitting Walmart! Now that Black Friday has passed we are beginning to receive reports that Kithaba with the red bandana is now surfacing at Walmart. Please let us know what you have found and please also send photographic proof. Keep your eyes open for this very interesting running change! I can confirm finding the 501st Legion Clone Trooper at Walmart, which is part of this same wave - just no red bandana Kithaba for me yet. Don't believe the lies of Toys R Us (laugh out loud). The Clone Wars vehicle 2-packs which are as high as $45.99 in some stores (gadzooks!) are still on sale through November 25, 2012 for $19.99 each, not only good for Black Friday. Good luck to all of you! This is a steal no matter how you slice it. Special thanks to JTA moderators Sjefke and The_Question for this tip! We may never fully understand how the Darktrooper from 1998 became the #1 Fans' Choice Saga Legends winner for 2007. We also want to know why they changed his name from two words to one, but we're inquisitive that way. See why Hasbro should have just updated the figure instead of rereleasing it in our Research Droids Reviews today! Feel free to leave your own thoughts in our comments section, vote in the poll or even leave comments about it on our Facebook page. Click the banner below for the direct link to the review! As always, you can also send your own personal review requests via email if you'd like to see something that we didn't cover yet. 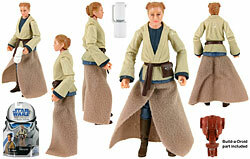 Young Owen Lars is next up for our Visual Guide updates as we roll through the final wave of The Legacy Collection. Click below to check out our detailed guide, and make sure to stop by our Research Droids Review for full details, as well as updated photo galleries. One of the most surprising finds today was the highly sought after Movie Heroes wave 2 special value 8-pack of figures for $25, especially since I wasn't there until 12 hours after the Black Friday madness began. But probably even more surprising was a lone Clone Trooper (501st Legion) figure, THE ONLY The Vintage Collection figure hanging from the pegs in the Star Wars aisle at this Walmart! Post your finds today in our comments! Click through to check it out! Black Friday Finds: Toys R Us! Again, even arriving nearly 8 hours after the store had already opened, yours truly found plenty of the Special Value "Shadows Of The Dark Side" vehicle 2-packs for $19.99 each! WHAT A STEAL! Click through to check it out! Even while vacationing in the sticks of upstate NY, Hey Dan!, I managed to find stuff rather plentifully at the local TARGET store on Black Friday! I avoided all of the early morning craziness and didn't enter the store until around 9 AM and this is what I still managed to find! Click through to check it out! Here is a quick update about tons of new preorders and our Black Friday Sale! Black Friday Sales end Monday evening, November 26th. Please Note: BBTS Will be closed Thursday November 22nd and Friday November 23rd in observance of Thanksgiving. We will reopen on Monday November 26th. Please note that email replies will be delayed until Monday. Man, do we need an update to TC-14 or what? Hasbro has some great protocol droid sculpts (especially the Build A Droid version) so let's have at it, OK? TC-14 is cool because her accessories are really cool, but the figure needs some sprucing up. 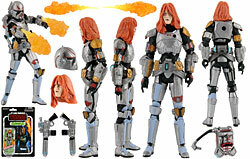 See what you think about her in our Research Droids Reviews today! Feel free to leave your own thoughts in our comments section, vote in the poll or even leave comments about it on our Facebook page. Click the banner below for the direct link to the review! As always, you can also send your own personal review requests via email if you'd like to see something that we didn't cover yet. Young Beru Whitesun makes her action figure debut in the final wave of The Legacy Collection! Click below to visit our detailed Visual Guide, and stop by our Research Droids Review to read more details about this figure! The Ultimate Action Figure Collection Is Officially OUT! The Ultimate Action Figure Collection is now in stock at Amazon.com and I don't even have my copy yet! It ships FREE, so why not order a whole bunch? Hobby Stock Still Has Some Great Loose Figures For Your Collection! eBay store Hobby Stock has some great deals on single figures, and "reasonable" deals on hard-to-find-by-themselves other figures. Check out to see what they have and if they can fill some holes in your collection! We're eyeing one of the red Snaggletooth figures, Hobby Stock! The staff at Jedi Temple Archives wish a very Happy Thanksgiving to our fans, readers, support staff and everyone else that doesn't meet those identifiers. We are extremely thankful to all of you for your continued patronage of our site and the feedback you consistently give. But we want you to take this time to survey all what you have to be thankful for aside from all the Star Wars stuff that brings us all joy (and what we talk about everyday here at JTA) because there are plenty of things we have that we are all guilty of taking for granted. Happy Thanksgiving to all! We're thankful for many intangible things in our lives, but if you asked us what were some of the collectibles we're thankful for, we would have to say one is the Boba Fett Premium Format Figure. Check out this awesome high-end collectible in our Research Droids Reviews today, and Happy Thanksgiving to you and your family! Feel free to leave your own thoughts in our comments section, vote in the poll or even leave comments about it on our Facebook page. Click the banner below for the direct link to the review! As always, you can also send your own personal review requests via email if you'd like to see something that we didn't cover yet. Republic Attack Dropship In Stock At TARGET.com! Holy crud! The Republic Attack Dropship is IN STOCK at TARGET.com as of this posting. Don't expect it to last! Special thanks to JTA reader Matthew R. for the head's up! 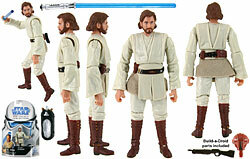 Obi-Wan Kenobi is next up for our The Legacy Collection Visual Guide updates! Click below to check out this all new version from Attack of the Clones, and stop by our Research Droids Review for extensive figure analysis, detailed stats and more! Is it just us or is Princess Leia Organa a little too chubby in the face? Check her out in our Research Droids Reviews today. Feel free to leave your own thoughts in our comments section, vote in the poll or even leave comments about it on our Facebook page. Click the banner below for the direct link to the review! As always, you can also send your own personal review requests via email if you'd like to see something that we didn't cover yet. If you haven't had the opportunity of viewing the lovely custom Original Trilogy poster set by Lynx Collection, head on over to their Etsy shop to pick up a set! They are available in 17x11, 18x24, and 24x36. Hurry, they're selling fast! U-3PO was a surprise for all (or nightmare, depending on which way you look at it) when Hasbro made a running change/correction to his color, leaving us with not one, but two BADs to put together from this wave! Click below to check out both the silver and the champagne versions of U-3PO—or E-3PO if you are so inclined! Don't forget to stop by our review for this figure too, featuring an all new updated gallery! If you haven't picked this up yet Amazon.com has the Star Wars: The Complete Saga Blu-ray collection available at half off! This is a great chance to get the whole Saga at a great price, or to pick it up for someone for Christmas! A big thanks to our friends at Yakface.com for the heads-up! Sponsor Announcement: Dorkside Toys Black Friday Sale! JTA sponsor DorksideToys.com updates us with news of a great Black Friday sale in addition to some other great bargains! Click through to learn all about it! Even if you don't collect the Jumbo Vintage Kenner Figures line, you should probably make an effort to secure Darth Vader for your collection. Find out why in our Research Droids Reviews today. Feel free to leave your own thoughts in our comments section, vote in the poll or even leave comments about it on our Facebook page. Click the banner below for the direct link to the review! As always, you can also send your own personal review requests via email if you'd like to see something that we didn't cover yet. Next up for our The Legacy Collection updates is another awesome addition to the line: Ugnaught! Click below for our detailed Visual Guide, and, if you ever wondered what our very FIRST Research Droids Review was then wonder no more! Click here for a look at RDR #1: Ugnaught! Upcoming JTA Contest! Prepare Now For The Insane Fun! We're gearing up for another fun contest here at JTA! It's been just a few days over a year since we did our last one. It was a roaring success and our readers had a blast completing my insane missions! Well, back by popular demand, we're going to do it all over again this December. But we have one rule. In order to participate, you must be one of our Facebook fans before 12 midnight on December 1, 2012. To be completely clear, like our Facebook page through November 30, 2012 (11:59 PM EST). We're going to give away some great figures again for this contest. Stay tuned for more information! Click the image below to like us on Facebook! To see some of the fun we had last year, check out the various missions HERE if this is new to you! Sponsor Announcement: DASH Hot Toys Luke Skywalker Giveaway! It’s time for the latest contest from Collector-ActionFigures.com, and we couldn’t be more excited about this one. When it comes to action figures, Hot Toys makes the best in the world, and they’ve finally started on Star Wars with the Luke Skywalker (Bespin Outfit) figure. And we’re giving it away. You could win this $300 prize, which includes two complete figures, a load of accessories, and the high quality sculpting, paint, and design that only Hot Toys offers. Click through for details! We continue looking at the awesome releases in the Jumbo Kenner Vintage Figures line and now it's time for the Sand People. This figure isn't 100% accurate though so click through to enter our Research Droids Reviews today to see why this is so. Feel free to leave your own thoughts in our comments section, vote in the poll or even leave comments about it on our Facebook page. Click the banner below for the direct link to the review! As always, you can also send your own personal review requests via email if you'd like to see something that we didn't cover yet. Apology accepted, Captain Needa... Click below for the Visual Guide for Captain Needa, who should have never assumed full responsibility for losing the Millennium Falcon! After checking out the guide, make sure you stop by and check out the full review! K & C Collectibles has added Star Wars Transformer Crossovers to our inventory. Mandalorian Assault Transport and more Clone Wars vehicles are in-stock. Click here to view all the NEW Product. You can click through for all the new product announcements too! UK Readers - You're No Longer Forsaken Either! We have a great report from the UK! Click through to reader JTA reader Rob's recent retail account!! This just goes to show that the stuff is out there and although it's taken forever to arrive, at least it IS arriving finally. TVC Wave 13 Hits TRU + Great Buy Two Get One FREE Promo! JTA moderator and field rep Paul B also makes us envious over his local find at Toys R Us. Wave 13 is becoming plentiful at this store now! The best part? It's buy 2 get one FREE through November 21st! Click through to see this great find too!! Previously Hard To Find Items Consistently Arriving At TARGET! JTA moderator and field rep Paul B shows that new stuff is even hitting Ohio! Click through to see what graced the shelves at his local TARGET! The 2007 30 (77-07) Saga Legends line brought us some of the best-looking Sandtrooper action figures. This is one of them. We study the first version of the Sandtrooper sergeant in our Research Droids Reviews today. See why you'll want one of him. Feel free to leave your own thoughts in our comments section, vote in the poll or even leave comments about it on our Facebook page. Click the banner below for the direct link to the review! As always, you can also send your own personal review requests via email if you'd like to see something that we didn't cover yet. BREAKING NEWS: All The Details Regarding The Walmart Black Friday Packs! Please head to THIS REPORT at our friends at Yakface.com right this second! The details surrounding the Black Friday multipacks are so much more than we initially thought and certainly more than meets the eye has been revealed. SCUBA Ahsoka? Yup! Just head there now! Tonights Visual Guide update features a small run we've been sitting on for a while and meaning to add to the archives. We'll take a look at the final two waves of The Legacy Collection as we gear up for another round of Build A Droid in 2013! First up is Emperor Palpatine, featured from The Empire Strikes Back as he contacts Darth Vader during the Sith Lord's pursuit of the Millennium Falcon. 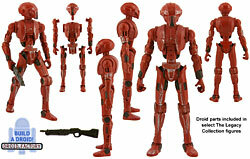 Click below for our Visual Guide, and read about this figure in our Research Droids Review! JTA Facebook friend Nic S. writes in with a tip for a TARGET sale on The Vintage Collection. While we would have laughed about this last week, wave 12 is starting to hit pretty hard at TARGET so it may be worth your while to check it out. TVC figures will be on sale for $7.99 each! Thanks for the head's up Nic. Sale starts Sunday and ends Wednesday. More Mandalorian Transports For You! The Mandalorian Transport two-packs are hitting very hard. Despite initial reports of some stores receiving damaged boxes, new arrivals are in excellent to pristine condition. (They must have started from the bottom of the bin first.) We'd also like to offer a perspective that Hasbro must have lost their shirts on the Shadow Of The Dark Side line (simply by what's arriving now). The line was relatively easy to find during its run (with a few exceptions), yet it seems utlimately that it didn't sell and meet projections. Class I sets are now sitting on the shelves in clearance stores like TJ Maxx and it also appears that an end to these double-packed Class II sets are nowhere in sight. Now if only The Vintage Collection stuff could just find its way to us! Click through to see what we found in our local TRU today! 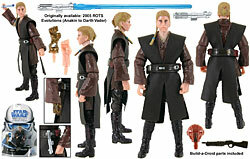 The 2005 Revenge Of The Sith Saesee Tiin didn't come with a soft-goods Jedi robe, but the 2007 30 (77-07) Saga Legends version did. It's also the focus of our Research Droids Reviews today, so check it out! Feel free to leave your own thoughts in our comments section, vote in the poll or even leave comments about it on our Facebook page. Click the banner below for the direct link to the review! As always, you can also send your own personal review requests via email if you'd like to see something that we didn't cover yet. Fans of the sixth scale line from Sideshow Collectibles had to wait years for this one! 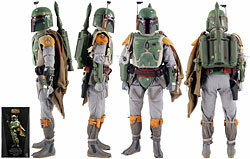 But (finally), in 2012 we saw the release of the Boba Fett 1:6 scale figure! While not perfect, it's a great addition to the line! Click through to check out our highly detailed Visual Guide, and see our additional gallery pictures in our Research Droids Review! Reader's Digest Recommends The Ultimate Action Figure Collection!!! Wow! Reader's Digest has recommended The Ultimate Action Figure Collection this year for the holiday shopping season! Check out their plug on the book! Exciting times! This week features four brand-new Gentle Giant pre-orders, new Angry Birds, Vintage Loose AFA, and Vintage-Style Wave 15! On the Gentle Giant slate, the Max Rebo Band mini busts continue to jam out with the latest release of the man himself, Max Rebo! 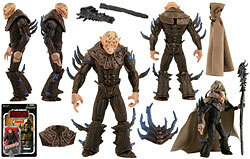 Also new for pre-order is a Darth Maul Spider (arachnophobia beware!) statue and a Sandtrooper on Dewback maquette. Vintage-Style Wave 15 is now available and quantities are selling fast! This "lost wave" includes twelve new figures from Ahsoka Tano & Aurra Sing to Republic Trooper and Orrimaarko. Two new Angry Birds Star Wars battle games have also landed instock: Jenga Hoth and Tatooine! For more great stuff from this week, such as the Vintage Loose Yak Face AFA and Sise Fromm, visit the Brian's Toys Newsletter! We have received a few emails from readers regarding a rumor report post found HERE at Rebelscum.com. 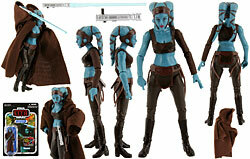 The list of figure featured in that report are part of wave 1 of The Clone Wars line for 2013. While not every single figure listed was pictured in the slides, you can see most of them in our CVI coverage of the Hasbro Presentation right now. Keep in mind that these are prototypes and anything can change right before they're released. It is going to be an exciting year isn't it!? She Loves Us, She Loves Us Not! Carrie Fisher is NOT appearing in Episode VII as first reported by TheForce.net. Click through for the clarification at EOnline.com! Fisher Confirms Appearance In Episode 7! TheInsider.com is reporting via a fan that Carrie Fisher has confirmed she will appear in Episode VII. Click through for the full report! We will NEVER understand how the RA-7 droid beat out so many others in the 2007 TAC Saga Legends Fans' Choice poll, but it did. See our disdain for it in our Research Droids Reviews today. (Dan – you got lots of 'splaining to do!) Feel free to leave your own thoughts in our comments section, vote in the poll or even leave comments about it on our Facebook page. Click the banner below for the direct link to the review! As always, you can also send your own personal review requests via email if you'd like to see something that we didn't cover yet. Han Solo and Princess Leia have to get inside the Imperial bunker; inside is the shield generator that protects the second Death Star. R2-D2 starts to unlock the blast doors, but a stormtrooper's well-aimed shot fries the droid's circuits. Using a captured AT-ST walker, Han tricks the Imperial officers into leaving the bunker, where they are quickly surrounded by Rebels and Ewoks. Check out our latest Visual Guide—a Battle Pack based on this great scene from Return of the Jedi: Shield Generator Assault. You can also read our full review on this set right here! April Case Assortments Of Movie Heroes Now Arriving! Holy moly! Hot on the heels of finding wave 12 at TARGET, I have now just found wave two of the Movie Heroes (the one with the Qui-Gon Jinn and Obi-Wan Kenobi light-up figures) line at TARGET in Langhorne today. These were supposed to arrive in April, not the middle of November. I suspect we will be seeing the Star Wars [The Phantom Menace 3D] line well into 2013! Click through for the proof. Original Trilogy Poster Art Now Available For Your iPhones! Take some Star Wars art with you! Etsy has the prints we posted last week now available as iphone 4 & 5 covers. Check out these unique ways to show your love for Star Wars! Important Announcement For The Ultimate Action Figure Collection! We have an important announcement from our friends Anne Neumann and Steve Sansweet from Rancho Obi-Wan with regards to The Ultimate Action Figure Collection book! Click through to read more, especially if you're looking for a signed copy! Star Wars toys have finally been inducted into the National Toy Hall of Fame! It's about time! Special thanks to our good friend Dan Curto for passing this along to us! Here is another fan-requested Saga Legends figure, R4-I9. This astromech often gets confused with R4-D6 because it is actually identical to R4-D6 (even though Hasbro didn't make them look identical). However, it is a different character altogether. This one is on the Death Star and NOT on the Yavin Rebel base. See this R4 unit in our Research Droids Reviews today. Feel free to leave your own thoughts in our comments section, vote in the poll or even leave comments about it on our Facebook page. Click the banner below for the direct link to the review! As always, you can also send your own personal review requests via email if you'd like to see something that we didn't cover yet. 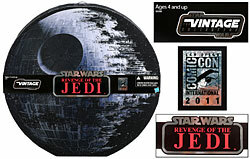 Our final update for The Vintage Collection Visual Guide features the mother of all exclusives: The Revenge of the Jedi San Diego Comic Con exclusive set. Featuring a whopping 14 figures on Revenge of the Jedi card backs (2 card backs unique to this set), this set was an instant bane to all TVC collectors when it was discovered that the two exclusive mini carded figures were numbered in line with the regular carded figures. Click below for our huge guide featuring this set and the 14 card backs included with it, and see the complete breakdown for this set in our Research Droids Review! With a total of 122 guides completed in our The Vintage Collection Visual Guide, including all basic figures (the equivalent to well over 1,200 images! ), be sure to stop by to find links to the entire collection! Oh The Humanity! Will The Teasing Never End? UPDATE: This ad is on Kmart's website, so this is the real deal! Special thanks to Jayson Krebsbach for pointing this out to us. 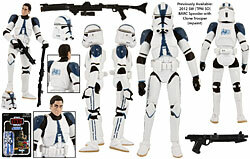 Hasbro released two different 501st Legion Trooper action figures in the 30 (77-07) Saga Legends line. We look at the first version in the Research Droids Reviews database today. Feel free to leave your own thoughts in our comments section, vote in the poll or even leave comments about it on our Facebook page. Click the banner below for the direct link to the review! As always, you can also send your own personal review requests via email if you'd like to see something that we didn't cover yet. 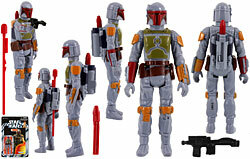 Our next Visual Guide update features the 2011 mail-away exclusive: Boba Fett (Prototype Armor). Packaged on a beautiful The Vintage Collection card back, this prototype version is a great addition to the line, and we give this a solid five stars in our Research Droids Review! O Canada! TVC Stands On Guard For Thee! Sponsor Announcement: Take A Shot With DASH! The world of action figures keeps getting closer and closer to the world of video games, and we here at Collector-ActionFigures.com are well aware of that fact. So to honor this week’s Halo 4 release, we’ve decided to partner up with McFarlane Toys to give away a great Halo 4 action figures prize pack. In fact, we’re giving away a prize pack including four different figures including Master Chief, Elite Zealot, Storm Grunt, and Spartan Warrior. Want to know more? Click through! Gentle Giant Ltd. certainly knows how to interest fans of everything vintage. They brought us both version of the classic Jawa in their Jumbo Vintage Kenner Figures line. Today's Research Droids Reviews entry focuses on the one with the cloth cape! Feel free to leave your own thoughts in our comments section, vote in the poll or even leave comments about it on our Facebook page. Click the banner below for the direct link to the review! As always, you can also send your own personal review requests via email if you'd like to see something that we didn't cover yet. Tonight's Visual Guide update continues with The Vintage Collection, taking a step beyond the basic figures and looking at the exclusive mail-away figure from 2010: Boba Fett (the one with the rocket!). Click below for a detailed look at this awesome Vintage homage, and don't forget to check out our review on this figure, complete with a brand new gallery to supplement our Visual Guide! Choke! Gasp! Faint! Collapse! This Is TARGET, Right? TARGET has to stop it with these shockers! Well, you're not going to believe this one. It's November and The Vintage Collection figures that should have graced TARGET's pegs in April are now arriving. To our shock and surprise we found the Darth Malgus wave just hanging at two TARGET stores. All of the figures from that wave were there except fro the Imperial Navy Commander. But sweet irony has a sense of humor, because this is the case assortment that has SEVEN The Phantom Menace carry-forward figures in it (WORST! CASE ASSORTMENT!! EVER!!!) So, it sure looks like you're going to have to fight off the holiday traffic now should you decide to start hunting at this retail chain again. But they are indeed arriving. Proof follows! 6 - 2 - 1! Contact! Toys R Us is getting loads of The Clone Wars "Shadow Of The Dark Side" Special Value Class II vehicle two-packs. And many of you are intent on finding them locally at your own store. If you check the overstock, you might notice that your stores are collecting these cases for the big Thanksgiving and Black Friday door busteres sales. Look for cases with the number 621 on them. This is the case assortment that indeed contains the Mandalorian Transport. You'll also find that for every four or five 620 cases there is about one 621 assortment (at least in the Philly area). Is it white hair or gray hair? 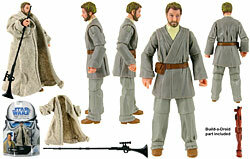 Gentle Giant Ltd. decided to go ambiguous with the Ben (Obi-Wan) Kenobi Jumbo Vintage Kenner Figure. Check him out in our Research Droids Reviews today! Feel free to leave your own thoughts in our comments section, vote in the poll or even leave comments about it on our Facebook page. Click the banner below for the direct link to the review! As always, you can also send your own personal review requests via email if you'd like to see something that we didn't cover yet. A Relatively Simple Tip To Make The Emperor's Royal Guard Even Better! JTA moderator Bombadgungan got so tired of looking at the floppy soft-goods on his new Emperor's Royal Guard figure, so he decided to do something about it and iron them! Look at the benefits this action brings forth to this incredible action figure! DorksideToys.com reports in with their latest arrivals and special! Click through for their latest updates! Tonight's Visual Guide update marks a big occasion: The completion of the basic line of figures in our The Vintage Collection Visual Guide! Shae Vizla (Old Republic Bounty Hunter) gets the honor of closing out this amazing run of figures! Click our detailed Visual Guide below, and stop by the main Visual Guide page for the complete run of Visual Guides from The Vintage Collection... complete in an easy-to-read layout with quicklinks to all of our corresponding Research Droids Reviews, including Shae Vizla! K & C Collectibles has the K-Mart Ewok and AT-ST crew 2-pack in-stock. 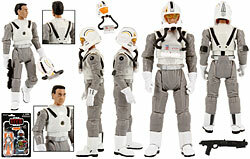 We have reduced prices on almost all Vintage Collection Action Figures. 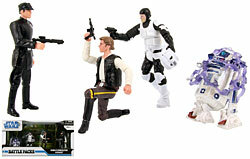 We also added Diamond Select Ultimate Quarter Scale Action Figures and added a lot of Clone Wars vehicles to the site. Clone Wars Commander Fox and Wolffe are back in-stock. HURRY! 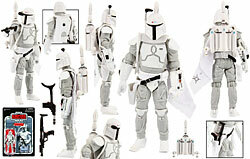 Mandalorian Transport In Stock At ToysRUs.com! Quick! If you're looking for the Madalorian Assault Transport Special Value Offer two-pack, it's in-stock at ToysRUs.com as of this posting. Special thanks to Dan @ StarWarsCollector.com for writing in and giving us the head's up! At least Gentle Giant Ltd. can make an actual true Death Squad Commander in the gray uniform. Then again, all they're doing is making an exact version of the Kenner figure.... just bigger. What a coincidence! See him in our Research Droids Reviews right now! Feel free to leave your own thoughts in our comments section, vote in the poll or even leave comments about it on our Facebook page. Click the banner below for the direct link to the review! As always, you can also send your own personal review requests via email if you'd like to see something that we didn't cover yet. Toys R Us Black Friday Promotion!!! It's quite possible we totally missed the memo on this (or just forgot about it), but Walmart has just started receiving an exclusive Darth Maul/Obi-Wan Kenobi lightsaber roleplay two-pack. It has been found in the Philly area. If you're interested, now is the time to start looking for it! The Clone Wars Figures For Under $3 In Ohio! JTA readers from Ohio listen up! You have a discount chain near you called Marc's and supposedly they are receiving The Clone Wars line (in the Shadows Of The Dark Side packaging) for $2.99 each. Characters like Embo, R4-P17, Shaak Ti and Boba Fett are just some of the action figures being found there. We have received two reports of this and we have one of our moderators out on the field attempting to get visual proof for you too. But if you're in Ohio, you may want to make a stop here and see what you can find! JTA reader J. Twist from Tulsa, OK writes in with detailed information about how his Amazon.com orders arrived and offers clues to what Amazon.com might be finding as problems with Lumat and other figures. Who are packing these figures? Cavemen? We're getting very clost to wrapping up the Visual Guides for basic figures from The Vintage Collection! Next up is Starkiller (Vader's Apprentice), another hard-to-find addition to this fantastic line of figures! Click below for our guide featuring the main character from The Force Unleashed. When you are finished browsing through our Visual Guide, make sure you stop by our full-featured Research Droids Review! We're months late reviewing the Lando Calrissian Jumbo Vintage Kenner figure. But he's finally ready in our Research Droids Reviews right now! Feel free to leave your own thoughts in our comments section, vote in the poll or even leave comments about it on our Facebook page. Click the banner below for the direct link to the review! As always, you can also send your own personal review requests via email if you'd like to see something that we didn't cover yet. Original Trilogy Poster Set - Beautiful Artwork! Star Wars, The Original Trilogy CUSTOM Poster Collection! Print size - 11" x 17." LIMITED to only 750 prints! These will never be printed again! Includes all original trilogy posters for Star Wars A New Hope, Empire Strikes Back, and Return of the Jedi. Visit Etsy to secure a set for yourself! These are also available in 18" x 24" if you want something a little bigger! A lot can be said when there is time to enjoy and savor your action figures. I am in the midst of reshooting waves 1-6 of The Vintage Collection and if you've been hanging out with me on Facebook, you've been catching a lot of the updates being made. I have been trying to study every possible detail to capture it all for the new galleries. (In fact, that's how I discovered the Yoda variation.) But I came across a relatively "shocking" feature to the stunning Zam Wesell figure now. (Yes, she is still stunning to me despite having brown hair.) I have also done my due diligence and checked the photo guides at all the other main Star Wars fan sites you normally visit too in order to say that I think it's safe to say that you're hearing this first here. Click through for more! This week features lots of new as well as restocked Gentle Giant, Master Replicas, and vintage items. A Master Replica Stormtrooper Blaster and Shadow Stormtrooper Helmet will turn some heads, but check out a nice collection of Gentle Giant stautes that include a new Darth Malgus and the old Jabba the Hutt with Slave Leia. Also new this week is a Vintage-Style Millennium Falcon vehicle exclusive, Star Wars Artwork, and a pre-order for the Sideshow Collectibles Darth Maul Legendary Scale Bust! For more from this week's newsletter visit the Brian's Toys Newsletter! So we have already heard that some of you want to see Steven Spielberg direct the next Star Wars film. Yahoo! Movies has the answer to that! Hard To Find TVC Figures At HasbroToyShop.com!!! Hurry! 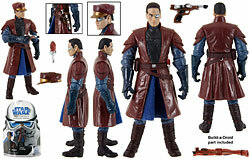 Darth Malgus, Shae Vizla, Starkiller and Imperial Navy Commander all in stock at HasbroToyShop.com as of this post time! Special thanks to good friend John F. for the tip! It appears as if collectors who are purchasing The Vintage Collection Lumat figure from Amazon.com might be getting something else instead. Anyway, Lumat is under review! Special thankd to JTA reader Brandon Y. for this info! Our Wave 14 updates take a slight break as we continue our early look at Jocasta Nu, the last The Vintage Collection exclusive—and only available at Brian's Toys! After you've read our in-depth review, make sure to browse through our detailed Visual Guide for an advanced look at this highly ranked Fans' Choice figure. A big thanks to our sponsor Brian's Toys for providing this early sample so our viewers can see more detail on this soon-to-be-released figure! Jedi Temple Archives finally has its Chief Librarian to keep guard over all of the information housed here! 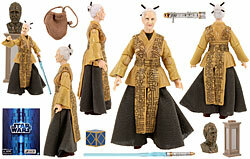 We eagerly present you with an advanced look at Jocasta Nu, a Brian's Toys exclusive. Thank you to JTA sponsor Brian's Toys for the advance sample! Be sure to order yours and let them know JTA sent you! See this long-awaited, high-ranking Fans' Choice candidate-turned-action-figure in our Research Droids Reviews right now! Feel free to leave your own thoughts in our comments section, vote in the poll or even leave comments about it on our Facebook page. Click the banner below for the direct link to the review! As always, you can also send your own personal review requests via email if you'd like to see something that we didn't cover yet. Next up for Wave 14 is another awesome figure to be added to The Vintage Collection: Nikto (Skiff Guard). This figure is another five-star ranked figure in our Research Droids Reviews, and you can check out the full Visual Guide below! We Have A Cool Advanced Look For You Of Jocasta Nu! The Darth Maul Legendary Scale Bust pre-order is live! If this one is on your list then click here to get it! Episode 7 Writer Determined Already? Has Episode VII found its writer? Vulture.com seems to think so! Special thanks to JTA reader Mike_5555 for directing us to this article! Wave 16 Is Disappearing - Amazon Is Gouging - Seek Sponsors You Will! JTA sponsor Dorkside Toys has single wave 16 The Vintage Collection figures in stock right now, many of which are half the price of what Amazon.com is asking! Be sure to check out their complete Star Wars stock. This wave is vanishing moment by moment. Do not delay, or you will pay! Here is a quick update about a bunch of cool new preorders and the latest arrivals at BigBadToyStore.com. Also, we've updated our site with improved graphics, an auto-fill search function, and a new image viewer for the product images. Many more upgrades to our site and systems will be taking place over the next year, stay tuned for more. The Cad Bane Maquette is pretty darn cool, but why does Gentle Giant feel the need to place their characters at awkward angles? Just place them in static poses please! See him in our Research Droids Reviews right now! Feel free to leave your own thoughts in our comments section, vote in the poll or even leave comments about it on our Facebook page. Click the banner below for the direct link to the review! As always, you can also send your own personal review requests via email if you'd like to see something that we didn't cover yet. 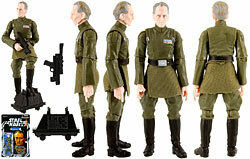 We continue our Wave 14 updates with another figure that we've waited a long time to see on Vintage-style packaging: Grand Moff Tarkin. Many, if not all, Vintage fans feel that this figure should have debuted during the Vintage era, but 35 years later is better-late-than-never! Check him out in the Visual Guide below, and read our full review right here! Let's Talk About The Vintage Collection, Baby! Royal Guard Or Royal Ripoff!? Unbelievable! It's been about a week since The Vintage Collection wave 16 officially arrived in the USA and into collectors' homes, but look what they are going for on eBay already. Amazon.com is no better and even worse in some instances. This needs to be an alarm to Hasbro that key "vintage" characters will always be in demand. Here is hoping that this figure gets carried forward into the Droid Factory line. And please don't support these exhorbitant prices. It only makes this whole process worse. Let them sit on them and bring the prices down again. The Aurra Sing Mini Bust is much better as a final product than a prototype. We love being pleasantly surprised like this. See her in her full glory (and curves) in our Research Droids Reviews today! Feel free to leave your own thoughts in our comments section, vote in the poll or even leave comments about it on our Facebook page. Click the banner below for the direct link to the review! As always, you can also send your own personal review requests via email if you'd like to see something that we didn't cover yet. It's time to start our final wave of figures that still need to be added to The Vintage Collection Visual Guide. Our Wave 14 updates kick off with Odd Ball (Clone Pilot). Click below to take a detailed look at this fantastic addition to The Vintge Collection... we happily gave this figure five stars in our Research Droids Review! Naboo Starfighter Hits Sweden Toys R Us Online! Could USA Be Imminent? The Naboo Starfighter has hit the Toys R Us online store in Sweden. It is possible that this may happen soon in America! Special thanks to JTA reader Malgus08 for this report! And keep your eyes peeled! Disney To Monopolize Every Last Facet Of Star Wars?! This is a "take it with a grain of salt" post. Special thanks to JTA readers Davy R. and Mike_5555 for alerting us to this news. Scruffy-Looking Nerf Herder Needed For Episode 7! Guess who is open to playing the role of Han Solo in Episode VII?! EW.com has the answer! Is Gentle Giant, Ltd. really going to release the Modal Nodes Cantina Band piece meal? We don't have the time or patience for that. Just knock them all out in a boxed set already! Sheesh! The latest release Tedn Dahai is exactly what you'd expect it to be: Figrin D'an with a fanfar (oh wait, didn't Figrin play that too?!). See why this Mini Bust hardly excites in our Research Droids Reviews today! Feel free to leave your own thoughts in our comments section, vote in the poll or even leave comments about it on our Facebook page. Click the banner below for the direct link to the review! As always, you can also send your own personal review requests via email if you'd like to see something that we didn't cover yet. We're getting closer to wrapping up our The Vintage Collection updates with the closing of another wave. Clone Trooper (501st Legion) wraps up Wave 13, and you can check him out directly in our guide below! 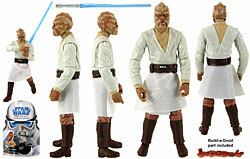 You can also revisit our complete thoughts on this figure in our Research Droids Reviews! Final TVC Wave's Arrival Turns Those 2012 Frowns Upside-Down! Wave 16 In Stock At Amazon.com For $12.99 - Order Those Onesies You Need! The Vintage Collection wave 16 figures are all in stock at Amazon.com as of this posting for $12.99 each and some qualify for FREE shipping depending upon how much you order. These won't last long! Click the logo below and begin searching for those you want to army build! Special thanks to JTA reader Rafael for the head's up! While we're still trying to recover from The Walking Dead's most shocking episode yet, why don't you read up on one of the most elusive Class I vehicle sets ever produced! What a shame, because the Republic Attack Dropship With Clone Pilot is actually one of Hasbro's best. It's all in our Research Droids Reviews today! Feel free to leave your own thoughts in our comments section, vote in the poll or even leave comments about it on our Facebook page. Click the banner below for the direct link to the review! As always, you can also send your own personal review requests via email if you'd like to see something that we didn't cover yet. EU lovers should be very happy with the addition of The New Jedi Order villain Nom Anor, the Executor, joining The Vintage Collection! Click below to check out our detailed Visual Guide! You can also read our full report on this figure in our Research Droids Review! Canadian Toys R Us Stores Gouging Collectors? We're not the only ones laughing at the ridiculous MSRP of exclusives. (We're looking at you TVC Millennium Falcon!) We've just received word from JTA reader Mark L. from Canada that the Yavin Pilot Pack and Ewok Pack TRU exclusives scan at $54.99 each. $54.99 EACH!!! We don't have visual proof of the shelf price tag, but if one of our other Canadian readers can verify this we would be very appreciative of that. Wow, that's just an ungodly price. TARGET Wastes Everyone's Time Marking Down Stuff We Don't Want! We're not sure why you would be interested, but TARGET is running a promotion on some of their figures and marking them down $2. Don't you love when stores run sales without any product? Approaching TARGET Clearances - We Have Some Information For You! Into the future we look! Click through for some intel we received on the upcoming clearances at TARGET! (It looks like Hasbro won't be sending any "old" Star Wars product TARGET's way now with these clearances fastly approaching. What a total waste TARGET has been for collectors in 2012! If you still don’t see the value of a membership on Collector-ActionFigures, then we’ve got a lot to show you. You might think DASH is just about our giveaways, since we’re giving away Sideshow Collectibles Snake Eyes and Transformers Masterpiece Thundercracker prizes totaling in value at over $250 right now. Those contests are a great reason to Like DASH on Facebook, sign up for a free membership, and become a part of the DASH Collector’s Club, but they’re far from the only reason to join DASH today. If you only read one review on a Premium Format Figure this year, then please make sure it's this one! We are going to get you to purchase one for sure! The Grand Moff Tarkin PF from Sideshow Collectibles is stunning, and it helps take away the pain of the Hasbro figure. (Actually, it takes away all of the pain!) You don't want to miss this entry in our Research Droids Reviews today, trust us!! Feel free to leave your own thoughts in our comments section, vote in the poll or even leave comments about it on our Facebook page. Click the banner below for the direct link to the review! As always, you can also send your own personal review requests via email if you'd like to see something that we didn't cover yet. James Burns Makes Appearance On The BBC! Congratulations to our good friend James Burns from JediNews.co.uk for his expertise and commentary on the latest news surrounding Star Wars on the BBC! Your friends at Jedi Temple Archives and very happy for and proud of you! Click the thumbnail below to see the interview! Yesterday we completed another wave from The Vintage Collection, and now it's time to move on to our remaining figures from Wave 13! Our first stop is a look at Aayla Secura, a beautifully done figure, and not just because it's Aayla! Check out the Visual Guide below, and then be sure to check out our full Research Droids Review for complete details! Well, here is a disappointing exclusive not worth being a PGM for at all! See the Imperial Storm Commando Mini Bust and see why we hope Gentle Giant Ltd. refocuses their platform on what exclusives they should do in the future. It's all in our Research Droids Reviews today! Feel free to leave your own thoughts in our comments section, vote in the poll or even leave comments about it on our Facebook page. Click the banner below for the direct link to the review! As always, you can also send your own personal review requests via email if you'd like to see something that we didn't cover yet. What an astute bunch of readers we have! While feverishly working on this article, I have already received three emails from readers informing me of this bizarre action by Hasbro and the 212th Battalion Clone Trooper from wave 5 of The Vintage Collection! Click through because this one is mind-boggling! We Told You So! Get Out There! JTA reader Scott K. sends us photo evidence of what Five Below stores are putting in their ad and at the front of their stores: wave 6 of The Vintage Collection. While earlier reports sugested that wave 3 was also part of this, two carry forward figures, the Rebel Commando and R2-D2 are part of the case assortment. Click through to see what you will be able to find at this store now! Also stay tuned for a mind-boggling report on one figure in this case assortment! The Vintage Collection Millennium Falcon Hits The East! The Vintage Collection Millennium Falcon has arrived at my local TRU, but be warned, the packaging was destroyed on both samples. I passed. When and if I actually consider this huge vehicle for purchase, it's going to have to be a perfect specimen. You should have used stronger cardboard Hasbro, this is going to be a tough sell now. Everything.... And That Means Everything.... Happens For A Reason! fiVe BELoW Resets Front Store Wheelbarrows With The Vintage Collection! FYI - there have already been multiple reports of new TVC figure being found at fiVe BELoW, but we have received word that stores are preparing to feature them in the wheelbarrows at the front of the store like they did with wave 4. You should be able to find wave 3 and wave 6 now. This doesn't mean your store will have this updated tomorrow morning.... but they should! I for one will be there 10:00 AM to army build the phase I clone trooper! Good luck to you! Remember: these are only $5 each here! Angry Birds Star Wars, eFX Darth Vader Helmet, and brand new Gentle Giant pre-orders! It's all there in the latest newsletter Brian's Toys! Make sure to stop by and check those and more out! Darth Malgus is one of those hard-to-find figures that many collectors are still hunting for! In the mean time, you can check him out in our detailed Visual Guide! Want to know why we gave this figure a solid five stars in our Research Droids Review? Read on! The Future Of Star Wars: Are You Really Already Moaning And Whining? We complete our assessment of the clone specialists with a careful look at the Clone Trooper Officer [Lieutenant] today who is ironically the most popular despite being the most frequent exclusive. Another great update, but is it better than The Vintage Collection version?? Some collectors beg to differ. See it all in our Research Droids Reviews right now! Feel free to leave your own thoughts in our comments section, vote in the poll or even leave comments about it on our Facebook page. Click the banner below for the direct link to the review! As always, you can also send your own personal review requests via email if you'd like to see something that we didn't cover yet. 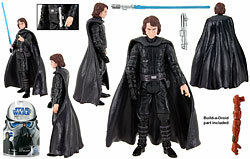 Anakin Skywalker, the first figure to be featured in realistic style, makes his debut in our Visual Guides. This was an awesome evolution from The Clone Wars animated style figures, and has since seen the release of several more beloved characters. Click below for our guide, and see what we have to say about the debut of The Clone Wars in The Vintage Collection line in our Research Droids Review! Sideshow Collectibles has their preview page up for the Darth Maul Legendary Scale Bust. Click here to check it out, and if this is on your wish-list then check back on November 8th for the pre-order! We look at the Clone Trooper Officer [Sergeant] today, one figure that Hasbro didn't too often get out in the basic figure lineup since 2002. This one is a great update, but will it be better than the upcoming 2013 Clone Trooper Sergeant in the Build A Droid line? Some collectors beg to differ. See it all in our Research Droids Reviews right now! Feel free to leave your own thoughts in our comments section, vote in the poll or even leave comments about it on our Facebook page. Click the banner below for the direct link to the review! As always, you can also send your own personal review requests via email if you'd like to see something that we didn't cover yet.